O/o the Deputy Commissioner, Sivasagar. 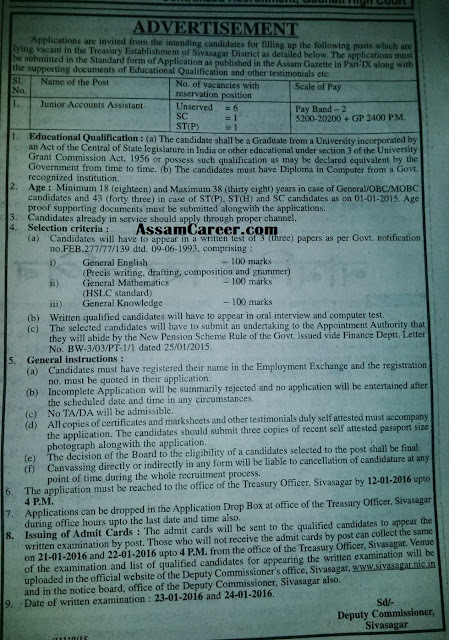 Applications are invited in Standard Form for filling up of the following vacant posts under the Treasury Establishment of Sivasagar District. Educational Qualification: Candidate must be a Graduate and having a Diploma in Computer from any Govt. recognized institution. Age: 18 to 38 years as on 01-01-2015. How to Apply: Pl view the following image. Click on the image to have a better view.